Smart homes leading to a dangerous future? We have smart T.Vs, smart appliances, even lamps that can now react to your mood. It should come as no surprise that creating the first truly Smart Homes is the next frontier for both Blue Tooth and connectivity. We’re practically already there. The way technology is advancing, hidden televisions, temperature monitors, remote-controlled blinds and central lighting controls may become commonplace sooner than you think. The question is, are we ready for it? Until recently, Smart Homes might have seamed like the territory of Science Fiction or futurists. Most of us are at least familiar with HAL 9000 in 2001 A Space Odyssey. As with any new innovation though, and as HAL 9000 illustrates, there are both benefits and risks. There are a lot of security issues that still have to be addressed before we’re all able to have our house cook dinner for us before we get home. The ideology behind a smart home is to have the home take care of you, all the while granting you more connectivity than ever before. Convenience is one of the biggest reasons that people build and purchase smart homes. These homes give users remote access to systems like heating, intercoms, music and multimedia devices throughout the home. Integrated hard drives might allow homeowners to watch videos or listen to audio in any room; video intercoms might make it easy to communicate with others in the home or visitors at the door. All of these smart home technologies streamline common tasks. Smart homes include advanced security systems with cameras, motion sensors and a link to the local police station or a private security company. Smart homes may also use key cards or other heightened identification measures in place of conventional locks, making it harder for someone to break in. For elderly or disabled residents, a smart home may give them independence for longer. Voice-command systems can do things like control lights, lock doors, operate a telephone or use a computer. Home automation allows an individual to set a schedule for automatic tasks like mowing the lawn, removing the need to perform these labor-intensive tasks on a regular basis. HOPE is a smart platform that enables elderly with Alzheimer’s to live a more independent life. Smart homes can be more energy-efficient. Lights can shut off automatically when no one is in a room, and the thermostat can be set to let the indoor temperature drop during the day before returning it to a more comfortable level just before residents return. All of these automated tasks, along with modern, energy-efficient appliances, combine to save on electricity, water and natural gas, thereby reducing the strain on natural resources. As I’ve already said, some futuristic devices are already here. In fact, you could probably consider our home’s education level to be somewhere around elementary school right now, laying the groundwork for more advanced technologies in the future. Samsung and LG released fridges in 2011 and 2012 respectively which can keep track of the food and beverages in your fridge, and tell you when something is near expiration. LG’s fridge takes it a step further than Samsung’s. It actually connects with your smart phone, giving you a shopping list in real-time so that you can get in and out of the grocery store with exactly what you need. Nest Labs created another smart device, although this one had a rocky start. It is a smart thermostat and smoke alarm, that can detect in real time when you’re at home, asleep, or at work and change the temperature of your home accordingly. The company claims it can save you up to 20% off of your heating and cooling bill. Belkins WeMo Switch+Motion is a motion sensors that can be attached to a room via a wall plug. When you leave or enter a room, it can turn on or off the lights accordingly. This is a smart home device on Kickstarter It is a speech controlled home automation device. With just a voice command, you can talk to and control everything in your home from lights to music, from climate to TV. The campaign will be ending on July 27. Apple has already started publishing patents. An Apple patent published last year displays a home relay server that communicates with mobile devices, then estimates the location of the user. Essentially, your home could welcome you home. 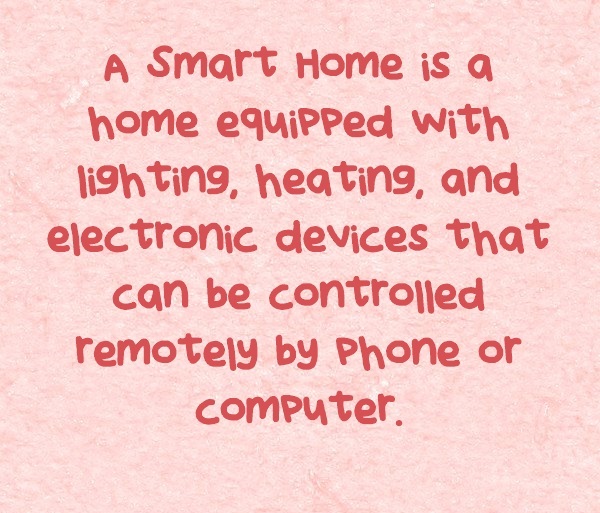 The basic premise is that our homes are currently stuffed with smart appliances, but there’s no centralised control. Apple’s aim is to change that. Here are just a few of the ways that HomeKit wants to shake things up. With the launch of this service, you’ll have the convenience of driving up to your home, and watching your garage door open automatically. House-of-the-future is then kind enough to unlock the door from the garage to the kitchen, adjust the temperature to your personal specification and pre-heat the oven for that recipe you selected that morning. Of course, this service wouldn’t be truly Apple unless it worked with other technology. Consumers will be able to interact with their gadgets and devices such as TV, tablets, laptops, smart bulbs, cameras and probably robot pets, all from a centralised location. As our physical world becomes more digital, problems that used to be limited to computers are moving into the physical world as well. It’s happening already. Earlier this year, Ohio parents found that a hacker had infiltrated their baby monitor and was yelling at their 10-month-old. The Nest Smoke Detector (which you can see images of earlier in this post) was recently recalled by Google due to issues with its motion-based alarm silencing method. Before this breach was fixed, hackers could remotely turn off the alarm before entering your house. “Any system has the potential to be hacked … If someone really wants access to something and they have enough resources, they will get it.”says Eric Ackerman, dean of Nova Southeastern University’s Graduate School of Computer and Information Sciences in Fort Lauderdale.